Preparing for a job interview? To ensure your success, we had complied frequently asked Technical & HR Job Interview Questions and answers for Freshers and Experienced job seekers. Along with the interview questions, we had provided interview tips, interview techniques and interview preparation materials to help you plan and succeed in any type of interview like face to face, online, telephonic or Walk-in interview. We have written over 100 articles in this section, which are grouped into various categories to help you clear each round of a Job Interview. Go through the articles in each category which suits your Job profile. In each category, we had provided job interview questions on basic and advanced topics, metaliciously prepared by the industry experts in each domain. It is quite common that the candidates search and learn "Top interview questions" before going to an interview, without paying much attention to the basics. This may cost you a wonderful career. Here, we are going to talk about various aspects of the job interview right from the time you get an interview call to interview preparation to "How to answer interview questions". Once you receive the invitation to an interview, the first thing you should do is to do a research about the company which called you for an interview. Try to gather as much information about the company like establishment date, compensation policies, employee satisfaction level, type of work they do, verticals/domains they are working on, interview process etc. All the above info about any company is available on the Internet. To get a more appropriate picture, try to contact the current or ex-employees of the company whom you know in person or via friends circle. Please make sure that you are not asking for an opinion about the company from any top officials of the company. It will certainly backfire. Now, let us have a look at the importance of collecting the above information. First three info(Years in service, compensation, employee satisfaction) will help you decide whether the company is of your choice and in line with your long term career goals. If you are willing to take risks and want to make quick bucks, join a start-up. What ever be the case, if you had decided to attend the interview, write a “Thank You Email" for giving you an opportunity. Last three info on type of work, skills/technologies, interview process will help you identify the areas from which most questions will be asked and prepare accordingly. For example, if you are going for an software engineer interview at Goldman Sachs, you should know the basics of financial products and services offered by the company. 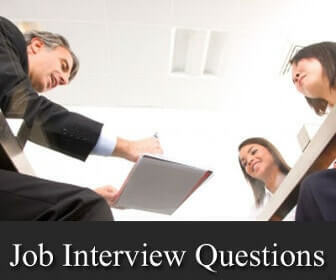 Coming to the technical aspects, you can expect job interview questions on Software security, Web based solutions etc. during an interview. Knowing the areas in which your possible employer works, will help you prepare more on topics which is relevant to your possible employer. Following the above steps, will help you nail any interview. Once you enter a room for an interview, the first thing you should do is to wish the whole interview panel with a smiling face. It is quite common that, most candidates will be tense while appearing for an interview, especially if you are a fresher. Take a few deep breaths and think about something which makes you happy, before entering the room. A candidate with a calm mind can tackle any question with relative ease. Usually, the interviewer starts with typical interview questions. Then, he slowly moves to advanced topics. This way, the interviewer can estimate your knowledge on base concepts as well as advanced features on a topic. Another aspect of asking popular interview questions at the start is to make you comfortable with the interview board. Once the candidate gets accustomed to the environment, you can expect tough questions. As a candidate, you should be prepared for all types of possible job interview questions. While answering a question, you should make sure that you are answering the question genuinely rather that reading out from a memorized answer. Take a pause for a few seconds, before answering the question. Also, let the interviewer complete question before answering the question. Don't jump the gun and answer the question as soon as he finishes the question. If you are facing an interview panel with more than one person, make sure that you look at each and every member of the panel while answering the question. In case you don't know the answer to a question, let the interview panel know that you don't. It is better to be honest than giving a cooked up answer. But, before saying a no, you should think about it for a few seconds and express your opinion. If possible, try to conduct a mock interview before appearing for the actual job interview. During the mock interview, try to give answers in-front of the mirror. This will help you analyze your body language and make appropriate tweaks. Practice before interview helps you identify the best choice of words while answering a question and improve your fluency. The above mentioned tips will help you tremendously during the Job Interview. One last piece of advice. Failing an interview is not the end of the world. There will be another 100 opportunities waiting for you. So, go to an interview with an open mind and confidence. All the best.